Color relativity is how colors appear when they are with other colors. How colors are perceived by us may be very different than how they are in reality, and are Dependant on a number of factors. The intensity of light and shadow, the warmness or coolness of the ambient light, and the color of other objects nearby can all affect how a color is perceived. In art and design, color usage can create striking optical illusions which change the perception of color value, tone, and hue. Do you know someone who has hazel eyes that appear to change color depending on what they wear? Or how about that car that seems to change color depending on the surroundings? These are real life examples of color relativity. There are three definitions relating to this phenomenon. I will use this photo of a rose as an example. Local Color is the color of the object in flat natural light without the influence of other colors, shadows, or highlights. This is the color that your brain perceives an object to be. This is the theoretical color, and cannot be truly observed. Your brain perceives this rose as red. You know that the rose is red even though there are many other tints, shades, tones, and even hues present. Relative Color is how colors appear when they are next to other colors. This can change depending on the surrounding colors. The shaded area on the right of the flower appears to be purple. However, when I color pick that, it is actually a dull magenta. 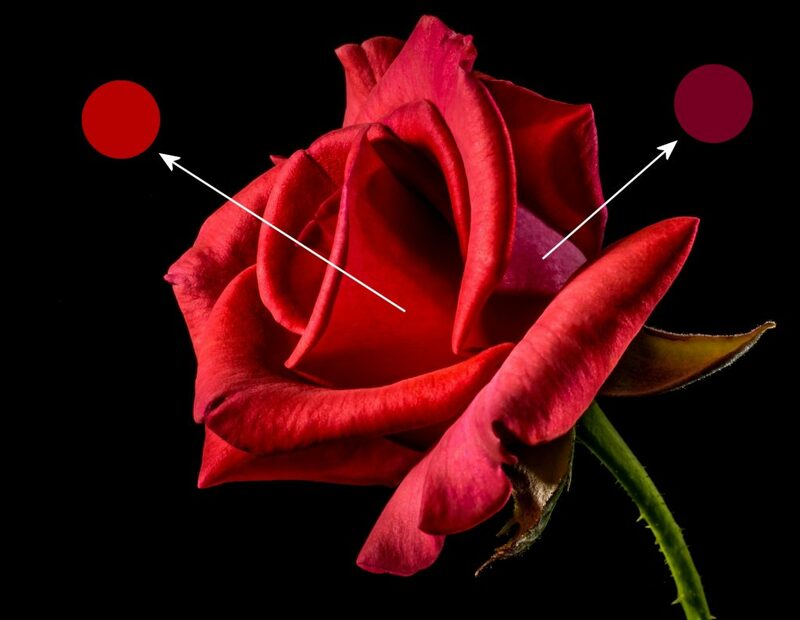 While the true color of that area is more purple in hue compared to the red of the rose, it is not as purple as it seems. Absolute Color is the color that is really there. This is the color that an area of a picture would have if you were to open it in an image editing software and use the color pick tool on that area. I have picked two areas on this photograph of the rose as an example. 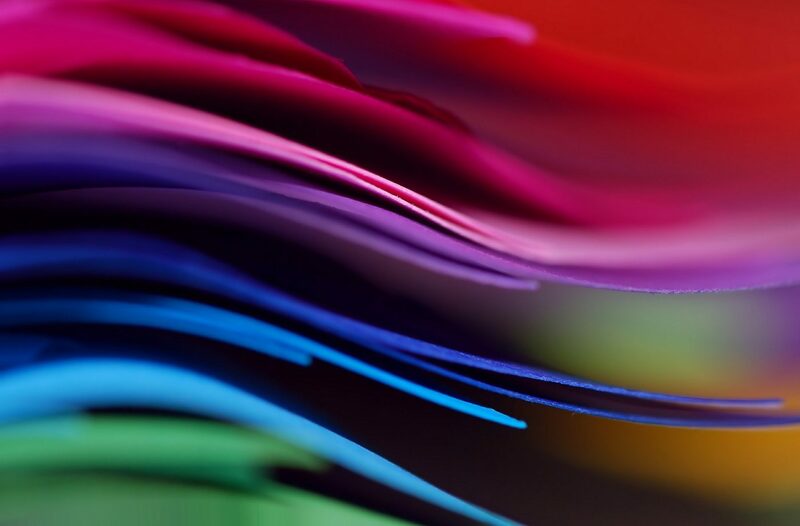 Colors can make each other seem more vibrant, and even cancel each other out, depending on how they are used. Placing two complementary colors, red and green for example, next to each other makes each color appear more vibrant. But, if those colors are repeated in smaller and smaller patterns, they actually have the effect of canceling each other out. You can see this effect in the image above. It starts out with four block of alternating red and green. At the edge where the green meets red, the green appears lighter and the red appears darker. However, there are only two colors, it is an illusion. As the pattern gets smaller, the red and green pattern starts to appear a dull brown. If you click on the image and see it in full size, you can see though, that the last square is still composed of pure red and pure green smaller squares; the brown is an illusion. Another example of this is how colors can appear warmer or cooler depending on the surrounding colors. Warm color such as red, orange, and yellow can cause nearby gray to take on a cooler blue tone. The gray circle in the field of yellow appears to be more blue than it is in reality. This perception can be used to imply a blue and orange color scheme where it does not exist, by using different tints, shades and tones of browns and grays. Checker Shadow Illusion courtesy of Edward H. Adelson on Wikipedia. Colors can also make each other appear lighter or darker than they really are. The checker shadow illusion above is an excellent example of this. Even though they are actually the same value, square A appears to be much darker than square B. Another demonstration is comparing a shade of gray against a gradient of white and black. I have created this gradient, which represents all the shades of gray between white and black. On it, I have placed a horizontal line of a shade of gray chosen from the exact middle of this gradient. Against the black and darker grays, the gray line appears to be lighter, and against the white and lighter grays, the line appears to be darker. However, it is the exact same shade of gray throughout the entire line. The background gradient makes it appear to be changing color. This entry was posted in Articles and tagged color relativity, color theory on April 17, 2019 by Rebecca Wang.